It’s December which means one thing: cookie recipes (aka my favourite Christmas cookie, this recipe for chocolate ginger molasses cookies). It also means something else: exams. This is how it works, I bake (and devour) an insane amount of cookies during exams – these Chocolate Ginger Molasses Cookies are a result of those stress-induced baking sessions. Believe me, there have been many. Sometimes I’m making chocolatey peppermint cookies or double chocolate pecan pie bars if I’m feeling extra indulgent. Because of these hours spent baking, I find that by the time I’m finished final exams, the holidays come and I’m all cookie-d out, I know, how is that even possible? Somehow, I power through and bake (and eat) more cookies. Then, January hits and I don’t want to see a cookie for two months – which is helpful for my annual “time to get healthy” New Year’s resolution. Back in October (2 months ago already – wow!) I hinted at some holiday recipes on Instagram and well, I can finally share them with you. I created three recipes for a favourite online magazine of mine, Sweet Lemon Magazine. 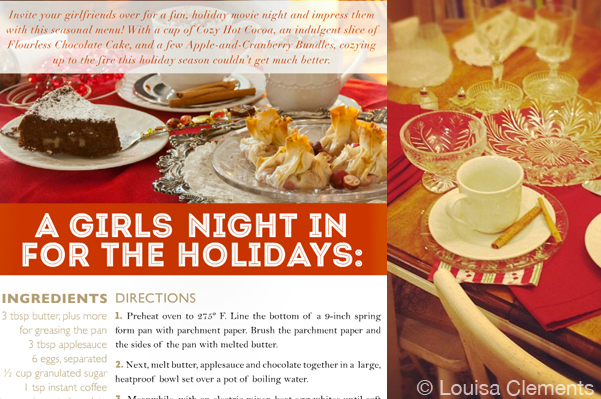 You can find the recipes for Cozy Hot Cocoa, Flourless Chocolate Cake and Apple Cranberry Bundles in my feature A Girls Night In For the Holidays on pages 122-124. And here’s a little behind-the-scenes from my shoot for Sweet Lemon! That’s me on the left, Sophie (who was really wanting some Cozy Hot Cocoa) and my lovely mother. Also, I’ll be blogging for Sweet Lemon as a resident foodie over on their Zesty Digest Blog – check me out! Back to the Chocolate Ginger Molasses Cookies, they were a pre-exam creation. They are a take off of my favourite Ginger Molasses Cookies and my favourite cookbook, The Flavor Bible, says ginger and chocolate go together really well. Like Audrey Hepburn and Gregory Peck in Roman Holiday, so I knew I had to try out this combination. What I love about these cookies is that first you taste the chocolate and then there is a hint of ginger and molasses, which becomes even more flavorful and is the perfect aftertaste. If there is one cookie to make this holiday season, it’s definitely these Chocolate Ginger Molasses Cookies. Combine chocolate, ginger and molasses into one chewy cookie! In a medium bowl, whisk flour, cocoa powder, baking soda, ground ginger, cinnamon, cloves and salt. In the bowl of an electric mixer, fitted with the paddle attachment, cream butter, brown sugar and 1/2 cup white sugar together until light and fluffy, about 2-4 minutes. Add egg, molasses and vanilla. Beat until combined. In two additions, with the mixer on the lowest setting, mix in the flour mixture. Finally, stir in chocolate chips. Roll dough into 1 1/2 inch balls and coat in remaining 3 tbsp white sugar. Refrigerate for 15 minutes before baking. Bake for 10-12 minutes until the surfaces are slightly cracked. Let cool for 5 minutes then remove to a wire rack to finish cooling. 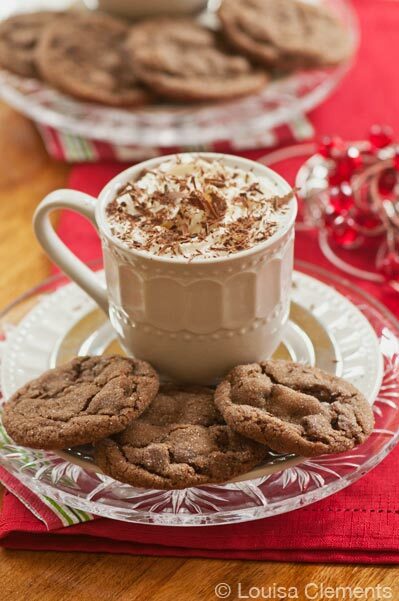 Let me know if you try these chocolate ginger molasses cookies this season!